Have I mentioned this hour that I love fluff in my MMOs? I believe there’s an inner completionist in all of us, and sometimes I think I can see mine. And she is a rabidly possessed, insane and obsessive-compulsive little girl. Which is why I’m surprised after all these weeks in the Rift beta I haven’t talked about the Artifact Collections system yet. Bottom line, I want to marry it. And it’s not just about filling out those empty slots over time, though there is something very gratifying about finding an artifact you’ve never seen before. I also like it because it encourages players to travel off the beaten path and it appeals to the explorer in me. Finding artifacts is as simple as that. Explore. Poke around. Look high and low. Stick your nose into any dark corner you see. Along the heavily traveled roads you will no doubt find some artifacts, but the majority I’ve found are placed in out-of-the-way places where an artifact spawn point is likely to be. Yesterday, I was dithering about Scarwood Reach when I noticed that telltale flickering light in the corner of my screen. I headed over and realized how lucky I had been to see it. It was well hidden, nestled in the hollow of a tree stump. Problem was, it was a big stump. The artifact was situated well above my head, far too high for me to reach. I saw that there was a taller structure nearby, a ramp of some sort, and I went up it to try to jump into the stump. The distance was just barely what a well-timed jump could manage. After failing the first half dozen times, I finally made it. I looted my prize and was pleasantly surprised to see that not only did I find an artifact to add to a new collection, a separate collection window had appeared informing me that I had found one of the rarer artifacts to be uncovered in Scarwood Reach! And companion pets. Oh noes, my life is over. If my pet collecting addiction and past experience is any indication, the more fluff there is in a game, the longer I stay with it. And admittedly, I’m not very used to seeing too many of these little extras in new games, especially not in betas. While it’s important to me, I also understand how stuff like this can be delegated to the bottom of the to-do list when other major features and systems like PvP, crafting, instances and overall general content should take priority. So I have to say I’m once again impressed at how far Rift has already come. Call me a pessimist but it seems more like someone took the concept of exploration and decided to add a grind to it. I was not at all impressed with this part of RIFT. I suppose it can be viewed as a grind. But it’s a nice little extra on the side for those doing exploring anyway, and the key being it’s not necessary. I appreciate it being there regardless, as I see it as a possible side hobby for the achievement freak in me. Well yeah that’s the other thing, I would NEED to do all of them and geez I just don’t have that kind of time! Reminds me a lot of what they did in Warhammer. Not so much the constant popups or streams of title unlocks within the Tome of Knowledge, but the Lairs, rare locations and mobs/items they granted and especially the Plungers of the World is what this reminds me of. I remember watching all these videos that this one designer (Paul Barnett) was in and he was always super excited about adding random bits to the game, like make a catacomb area randomly split off to the right when it normally goes left, and placing a lever in there with a sign that says ‘don’t pull this’ which would cause an obscenely high level mob to spawn and one shot everyone in reach. I’m not going to say it made WAR an awesome game, but I did like that guy’s ideas a lot. Probably cost thousands or dollars and months of development time to get those random ideas implemented, but if it wasn’t for that guy I probably wouldn’t have bought the game at launch in the first place. Oh, reading your comment, I remember I did something really silly like that in Age of Conan. I spent like half an hour sneaking into an enemy compound, and then I see this thing sitting in the middle labeled “Alarm Horn” when I rolled over it. You’d think I’d leave it alone, given how it was all but a warning not to touch it. Of course, idiot that I was, I saw something that was clickable and automatically activated it without thinking, and like an entire compound worth of enemies swarmed on me and beat me to a pulp. I just gained yesterday, fighting a death invasion, a pet, “The Harbringer of Regulus”. That made me lol in real life. 🙂 I love the sense of humour that this game, and their representatives, has. I’m a serious explorer, and love nothing more than to poke my nose into every corner looking for secrets. Or great sights. This is just one of many reasons I’m so excited for RIFT – they’ve found a way to encourage and reward the various playstyles, including Explorers, in a dynamic and fun way (unlike POI-based methods that only require you to run to points A, B, and C to get rewarded). Agreed, especially with the every corner thing. Most artifacts I’ve found are lying in plain sight when you run along the road, but the more uncommon ones I’ve encountered are always deep in a crevice or up in some hole in a tree somewhere. It really encourages you to keep an eye out and take in the sights around you. I love the artifact collecting. Not as much for the rewards, but I love exploring game worlds. Finding a shiny just makes it oh so much more fun. I liked finding badges in City of Heroes and I liked finding tome unlocks and such in WAR as well. Like you said, it gives you even more incentive to get off the beaten path. I think I’d do this just for the pleasure of completing collections and satisfying my OCD 😛 Which I actually had been doing before I found out about the rewards…they just make it that much better! Especially since it’s all cosmetic clothing, pets and mounts and stuff and not a necessary part of progression in the game, and I’m a sucker for vanity items. Last night I was tasked by my tradeskill person to build some stuff and take it to a quartermaster I’d never heard of in a city I’d not been to before. So I’m running along the road toward the mark on my map when I come to a section with red mobs patrolling the road and they’re 9 levels higher than I am, meaning nearly insta-death if I try to fight one. So I head off the road and end up climbing a mountain to get around the bad spot. At the very peak of the mountain is a glowy pile of bones. I clicked it and got what for the level of the zone would be a crappy staff, but for the level I was at. . . it was a nice upgrade. IOW, it appears they’re encouraging low level toons to explore higher level zones — not just for the collections, but for possible loot as well. I also find it interesting how the shinies appear to have static spawn locations (though not necessarily the same item from each location) and how they’re actually semi-hidden. Now if I could just get to the one on top of that rock in the Kelari Refuge. Still haven’t figured out the path to jump up to it yet. . . .
Haha, I know exactly the rock you’re talking about. It took some practice but I finally got it. That shiny is not always there but when it is, I make sure I can nab it. 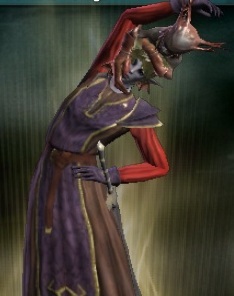 On a side note, I always found the jump animation odd in Rift as opposed to my other mmo, EQ2. In Rift I can high jump 2 body lengths but can only long jump a foot or so. It is the oddest animation, I bugged it and also complained on the forums about it. But they want you to climb and the easiest way to achieve that is to jump high. So I can see why it is the way it is but I do wish it was still proportional. If I’m taking a running jump, I’ll be nowhere close to where I should land based on how high I went. Awesome, that’s exactly what I was trying to get at, and it’s great to see others have the same experience. Most artifacts I find are along the road, but I get many of the new ones from questing around in an area and just seeing a shiny off to the side. Last night I came across one stuck in the side of a cliff…it took me a while to figure out how to get up there. I had to go around this entire mountain and found a path from behind to climb up and get it. It was another one I hadn’t seen before, have to say that felt pretty good. 🙂 I haven’t seen the one from Kelari Refuge, but I’ll be sure to keep an eye out for it now. Speaking of jumping yet again, there’s also this unmarked quest in Scarwood (? ?, the 2 “Scar” zones confuse me due to the similar names) but its just outside of Deepstrike Mines. There’s an npc crouched down under some scaffolding saying he left his weapon at the top when he ran to escape the creatures. No quest shows up in your journal and you don’t get the fancy “Quest Accepted” splash on the screen. You have to climb/jump your way thru 2-3 levels of the scaffolding. I gave up the first day cuz no matter what, there was one jump I just couldn’t make. Came back the next day and after probably an hour, I finally made it to the top, grabbed the weapon and took it down to him. I forget the reward (if any)but it was good to find something like that in game. As a bonus, 2-4 of the shinys tend to spawn in and on the structure as well. If we’re on the same server and of the same faction (Why on a PVE server are the factions locked away from each other? C’mon Hartsman! You did it right with EQ2! Why the backslide in Rift?) I’d be happy to make gear for you that you can use. Crafted gear seems to be a little better than nearly anything I’ve found as a drop or quest reward in the overland zones. I’d make runes for it to boost it even more too. @shar Seriously? Wow, I’m going to have to talk to all NPCs I encounter now. 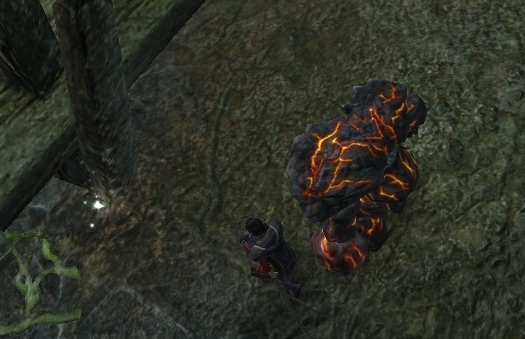 That’s quite a find, and not one of those extras I would have expected to see in Rift. I will keep an eye out for that too for live. Sounds like what you found was a cairn. There is one in every zone. They will always contain an item that is usable by your class and will scale to your level(the first time anyway, after that it will have junk). Damn, I was never able to find anything cool like a cairn! I love exploring. I spent quite a bit of time up in the mountains working my way across the ridge lines. I love the “fly” racial effect the elves get. I was able to get to many places no other race would reach. Since I like to explore, it is a nice added benefit to be able to find these little hidden treasures. I laugh to think of the one person at Trion that was tasked with finding hiding spots for thousands of shinies. Whoever it was they did a great job of placing them. I find myself riding along and using my left mouse button to look behind me for a missed twinkle on the other sides of the trees I pass, lol. So far I do not know about the rewards. I did complete quite a few collections, but never got to see what could be bought with the Lucky Coins. I can’t wait. What a great game!! What a smooth BETA!! Gonna be one of the best launches in MMO history (after such sadness as EQ2 launch (which recovered), Vangard Saga of Heros launch (which did not), and my most recent punch in the gut, Final Fantasy 14). Now all I need is a cute girl to sit on the couch with and game…….. hey im cute too. Don’t know if you saw my other post on “little things”, about how I found a chest up on a scaffolding and managed to tightrope up to it to check it out. I SO thought it would contain a rare artifact or piece of gear, but it turned out it contained a dead dwarf. I was totally foiled that time 😛 Made me laugh though. Lucky coin rewards look to be all vanity and cosmetic items like pets, mounts, costumes. I hope they will be adding more in the future as well. My favorite one so far is at the top of a tree in Gloamwood. I swear it is my new arch enemy, the jump is ridiculous to make and if it’s not the right angle you drop and nearly die every time. God I love Rift so far.